What happens when you inject something with ingredients designed to make it stronger? In the movies (or comics), you get characters like Wolverine. But real life has some stories to tell as well. Take thinset, for instance. Back in the 1940s, people used 2-3 inches of thinset beneath their tile. That’s because they needed to make sure that the cement had enough moisture to fully cure. If there wasn’t enough moisture, the thinset wouldn’t be strong enough to bond the tile to the subfloor. Unmodified thinset consists simply of cement, finely graded sand and water retention agents. It’s mixed with water before it’s ready to be spread out on the subfloor. To help strengthen thinset, Henry Rothberg invented a synthetic form of latex to be added to the thinset, thereby kickstarting the whole segment of modified thinsets. He took inspiration from modified concrete mixes of the 1920s that were used to repair and strengthen sea walls. However, he made sure that his synthetic latex had a longer shelf life and extended working time to suit tile installations. 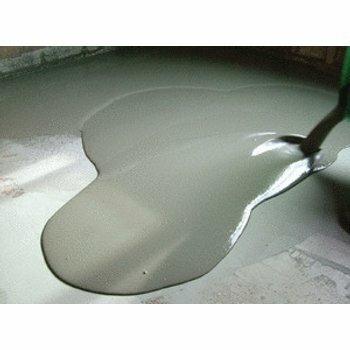 Twenty years later, the Tile Council of America developed a modified powdered thinset with dry polymers that were activated by adding water to the mix. These modified thinsets also went back to being as their name describes — thin — thanks to their added strength. Typically, they’re applied at about 3/16 inch thick when spread out with a 3/8 inch notch trowel. And for radiant floor heating installations, the thinset must be at least 3/8 inch thick in order to embed the heating element and adhere the tile. And tile installers haven’t looked back. Modified thinset is the product of choice for most tile installations because of its increased strength and bonding with minimal shrinkage, which means a reduced chance of cracks forming in the tile. WarmlyYours Radiant Heating recommends modified thinset mortar for nearly all tile and stone installations. However, if you’re using a Prodeso Installation Membrane, you’ll want to go “old school” and stick with unmodified thinset. 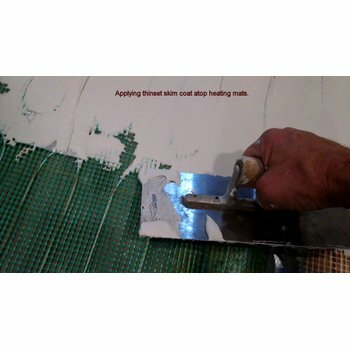 WarmlyYours’s Prodeso Installation Membrane is impervious, which means it will not deprive the thinset of its moisture. As a result, the thinset can properly hydrate, creating interlocking crystals that will form a strong, dense bond. Modified thinset, on the other hand, is not recommended because it relies on air to cure properly. 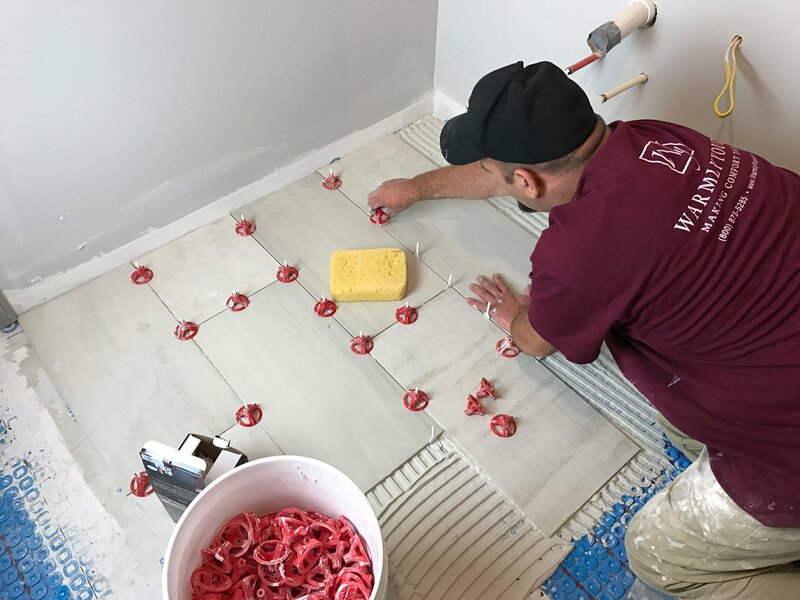 When sandwiched between two impervious layers — the tile and the installation membrane — drying can only take place through the open grout joints, which can take as long as 60 days! If an extended cure time is not observed before grouting, the results would be unpredictable. Therefore, it’s best to use unmodified thinset when working with an impervious installation membrane like Prodeso for installing radiant floor heating. It's important to note that latex-modified thinset can still be used between the membrane and the subfloor because it is not impervious. However, unmodified thinset should be used between the membrane and the tile. Remember to always consult and adhere to the latest installation instructions and product recommendations for your specific brand and type of membrane. Please note that there are currently a few companies that have tested and will offer a warranty on their brand of modified thinset when used between Prodeso and tile. Please contact WarmlyYours for details if your tile manufacturer requires the use of modified thinset. Always add the dry thinset mix to the water — not the other way around. Use a drill fitted with a mixing paddle to mix the thinset. Mix the thinset as if you’re mixing batter. Start slowly so as not to splash the powder or water out of the bucket and stop when it’s the consistency of frosting or peanut butter. Only make enough thinset that you can use within 20-30 minutes. This will prevent hardening in the bucket. To test if the thinset is still viable to use, test it with your finger. If the thinset sticks to your finger, it should still stick to the surface being tiled. If not, throw it out and start a new batch. Ensure that there are no air gaps during application of thinset. Make sure the heating cable, factory splices, and low-voltage thermostat sensor (if used) are completely embedded in the thinset. Don’t turn on the radiant heating system until the embedding thinset has fully cured. Turning the system on before the thinset has cured could cause the thinset to become brittle or it could cause the system to fail as a result of damage. This type of system failure will not be covered by most industry warranties. It usually takes 2-28 days for thinset to fully cure but make sure to defer to curing times provided by the manufacturer for the thinset you’re using in your project. Make sure to check out the entire line of WarmlyYours online tools like the Radiant Floor Heating Quote Builder (for side-by-side cost comparisons of different systems) or the Heat Loss Calculator, which can help you identify if floor heating can be a primary heat source for your project. So basically use unmodified thinset for tile over concrete, not concrete board but concrete itself. If you're just installing the tile over the concrete subfloor, then unmodified thinset is a good choice. However, if you're incorporating a floor heating system over a concrete subfloor, we recommend installing an insulating underlayment to prevent heat-loss to the slab. That underlayment is typically adhered to the subfloor with modified thinset and the heating system is embedded on top of it with either modified thinset or self-leveling cement before the tile is set. What would cause cement tiles installed above radiant heat to start to crack soon after install? Factors: I'm not sure what kind of thinset was used (mod or unmod). Not sure tiles were backbuttered. Not sure if tiles were moistened before install so as not to pull moisture from the thinset. Not sure if enough force was used to get a solid layer of thinset into the Ditra Heat mat so there was not any voids/air spaces under the tile. I also think the cable was run 2 studs apart from each other rather than the 3 studs specified in the Ditra install guide. Any experience with cement tiles cracking over heat? I am leaning toward having the job taken out and done over again (following all the installation guidelines) but don't want to do that if the same result might happen. Thanks. That's a really good question, and, as you identified, it's a question with a lot of factors that have to be considered. If the wrong thinset/adhesive was used, or if the thinset wasn't mixed correctly, or if the system was turned on before the thinset was fully cured, that could certainly be a cause of cement tile cracking. It's also possible that a subfloor issue (too much give in a wood subfloor or cracks telegraphing from a slab) could be the culprit. As far as the spacing of the cables in the membrane, if the heating cable is not spaced far enough apart it could cause problems for the system eventually, but it shouldn't be the reason your floor is cracking. Our sales manager has reached out to you via email and hopefully, with some more information, we'll be able to help more. I just purchased some Prodeso from a tile company that suggests I use modified thin set when I attach the tiles so I’m a little confused because that is exactly opposite of what this article says. They sell 253 Laticrete modified thin set. Also, is it a problem if there is not good adherence between the membrane and the subfloor. My contractor seemed to go a little light in the modifued thinseg under the membrane. My tile vendor is selling modified thin set to adhere the tiles. That seems to be exactly what you say not to do. They sell Laticrete modified thin set. What to do? Based on the latest information from Prodeso, modified or unmodified thinset can be used over the membrane, and tile manufacturer may need to suggest on the specific type. Please see the cross-section here: https://www.warmlyyours.com/en-US/publications/TEMPZONE-CABLE-PRODESO-HEAT-MEMBRANE-CROSS-SECTION-A.pdf Also we recommend to periodically check coverage of the membrane to the subfloor; in case of partial coverage, it is recommended to increase the amount of adhesive or its fluidity. Please see page 14 of the Installation Manual here: https://www.warmlyyours.com/en-US/publications/PRODESO-MEMBRANE-INSTALLATION-MANUAL-A.pdf If you need additional assistance, you can reach our 24/7 Technical Support by dialing 1-800-875-5285.